A larger company of the finance industry was very keen to increase the target efficiency and cadence of its internal release cycle up to the final delivery. The 4 development and test environments with 15 complex and heterogeneous integrated database applications converted each manual refresh into a nightmare for everyone involved; on the one hand for testing and business users which could not start their test execution because of unfinished environments, but especially for the team DevOps . Because updating an environment took at that time still more than a week - but only under optimal circumstances and if all components could be installed without incident which unfortunately happened very seldom. DevOps describes measures to overcome frequent break points between application development and IT operations in companies. The overall objective of the client (business) was the massive reduction of the release cycle to accelerate the process duration "time to market". For this purpose, all processes have been automated and tested with a corresponding also automated end-to-end test (keyword "smoke test"). These tests set on levels infrastructure, GUI access and business functions, and their results have been displayed accordingly after test end in OMdashboard. 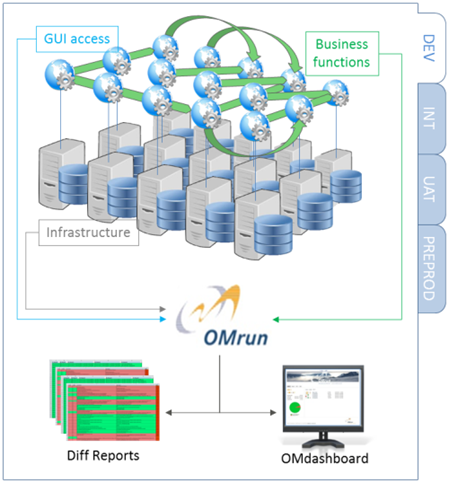 A test run in OMrun for a single environment took 20 minutes and was executed during office hours fully automated every two hours. Thanks to a big monitor placed directly at the DevOps team the status of every environment was visible for everyone and at any time. With this measure, the necessary basis was created in order to implement continuous integration (CI) and continuous development (CD) by agile methods (Scrum) in this company successfully. The entire refresh of an environment including all test runs lasted three hours only after the automation and the maintenance expenses of team DevOps could be reduced significantly. At the same time the satisfaction of all testing users was substantially increased due to the higher environment availability. In this manner, the aim to shorten the release cycle of earlier quarterly to two times per month was achieved also thanks to testtool OMrun (see customer experiences).